As announced a while back, Electronic Beats is shaking things up in 2016. Instead of hitting multiple European cities with two-day takeovers this spring, we’re concentrating all our efforts on one huge, five-day blowout in Cologne from May 18 – 22. Today, we proudly announce the first installment of the line-up. Legendary Nigerian drummer Tony Allen will grace the stage for a live show alongside Chilly Gonzales, Mø, local trio Woman and Christian Löffler and Mohna. Cologne’s own Kompakt family will host a special event with performances by Reinhard Voigt, Superpitcher, Michael Mayer, Fango and Matt Karmil, while deep house don Kerri Chandler, Grizzly and Noema complete the dance floor-oriented bookings. As always, the coming edition of Electronic Beats Festival will include club nights, concerts, exhibitions, workshops and more, hosted in venues, bars, clubs, ateliers, cafés and cultural hotspots around the city. 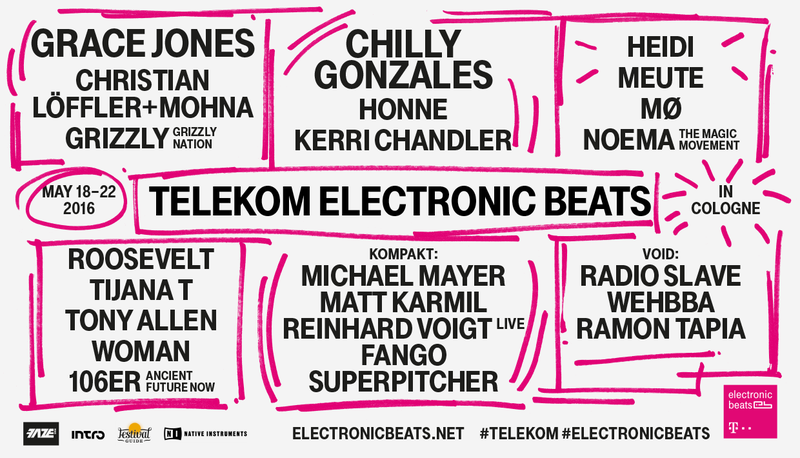 Keep an eye on the hashtags #electronicbeats and #telekom on Twitter and Instagram, and stay tuned for more detailed updates about EBF Cologne 2016 in the Facebook event. More info, tickets, venues and more here. Update: Grace Jones has been confirmed to kick off the festival on May 18th with her first show in Germany in seven years!